Crimp beads are most often used when stringing a beaded piece (like a bracelet or necklace) which has been strung with beading wire. The crimp beads finish the end of the beaded piece of jewelry and help create a loop for the clasp to be attached to. They can be used in the place of a bead tip or in addition to one in order to help keep the knot inside of the bead tip. There are two kinds of crimp beads: tube shaped and round shaped. The tube-shaped crimp beads are most often available in sterling or gold-filled, while the round are normally made of base metal. While it's all a matter a taste and preference, the tube-shaped crimp beads to be much easier to work with. So, if you are new to crimping, we would recommend starting with tubes, and those are the types of crimp beads (2x2mm) used in this tutorial. First, let's take a good look at the crimping pliers. This is a tool designed specifically for securing crimp beads. While some jewelry makers will simply use a pair of chain-nosed or flat-nosed pliers and flatten the bead to close it, we prefer to use crimping pliers to secure a crimp bead because I think it gives it a more polished look. To understand how to use crimping pliers, you need to have an understanding of how they work. Look at the nose of the pliers and notice how there are grooves inside of it. Now, let's look at the nose when closed. Squeeze the handles. Notice how the grooves line up. The grooves create two holes in the nose. The first is oval shaped, and the second is an oval with a dip on one side. Now you are ready to attach and close your crimp bead to your beading wire. 1. Take your crimp bead, and slip it onto the end of the beading wire. 2. Next, take the end of the wire and loop it back through the crimp bead leaving a small amount of extra wire as a tale. Position the crimp bead and thread in the second oval of the pliers (the one with the dip), and close the pliers around the bead. You'll see it curl. Next, turn the crimp bead to its side, position it in the first oval, and close the pliers around the crimp bead again so that you're compressing the curled bead into a rounded shape. Once your crimp bead is secure, trim off excess beading wire. You can either leave a little of the beading wire and insert the beads you string over it, or trim off all of it up to the crimp bead. 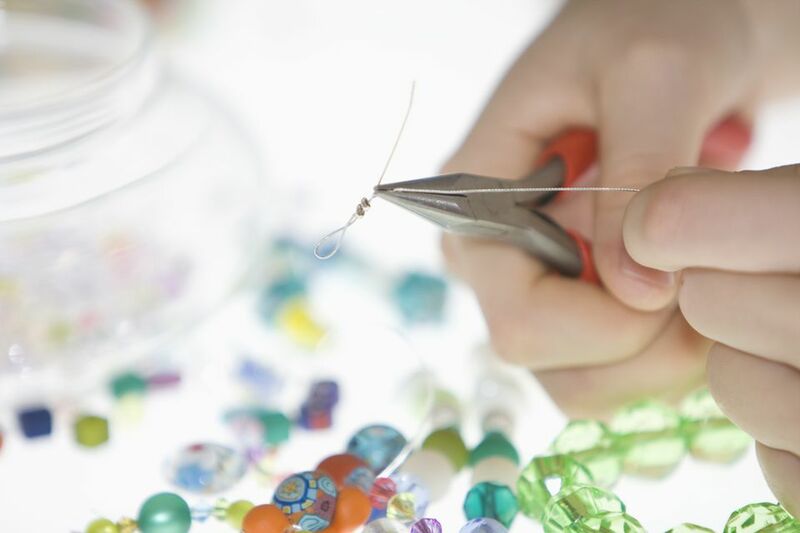 Just make sure you cut it cleanly using a sharp pair of wire cutters or beading wire cutter. Now you have a good loop that can be used to hold your clasp. So that the end of the beading wire does not scratch the wearer, make sure your last bead or two on the necklace is large enough so that a small amount of extra beading wire can be threaded back through. I have found that 4mm sized beads work very well for this. To keep the loop of your beading wire large enough, try inserting one side your your round-nosed pliers into the loop while you pull the wire tight. Use sterling tube shaped crimp beads rather than the base metal round beads. They are much easier to work with, especially for beginners. Do not expect perfection on your first, second, or even third try. As with any other jewelry technique, this takes practice in order to perfect your technique. Get a nice pair of crimping pliers, and do not try to fake a crimp with a regular pair of pliers. It just is not the same. 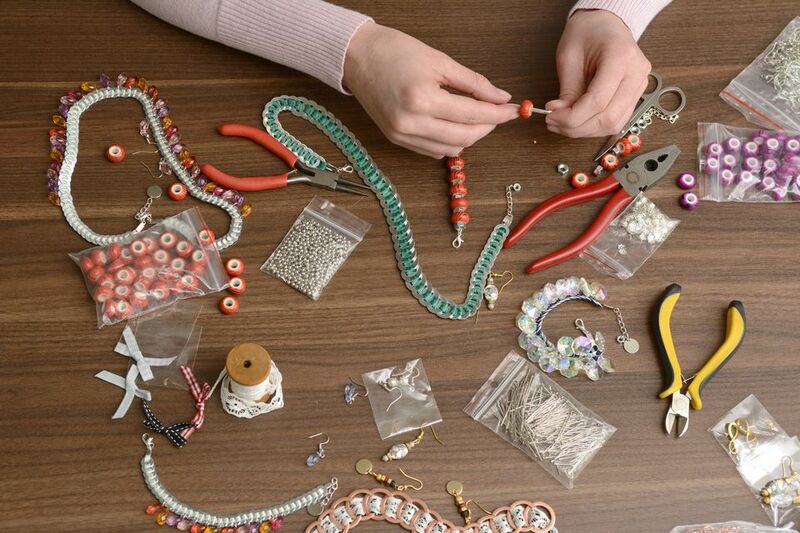 Most jewelry and beading suppliers carry crimp pliers and crimp beads. Make sure you use ​the right crimp beads with the right sized pliers.